Traveling from South Cyprus to Northern Cyprus. In April 2003 a very interesting development took place in Cyprus. For the first time since 1974 the borders were opened in Cyprus for the benefit of Cypriots. This allowed the Greek Cypriots to visit North and the Turkish Cypriots to visit the South of the island. Most Cypriots welcomed the opportunity to visit their old homes and meet with their old family. You may well notice that the weekends are busier in the Kyrenia harbour and in Bellapais with Greek Cypriots and many are once again making the pilgrimage to St. Andreas in Karpaz in Northern Cyprus. There is no hindrance on border crossings between the South and The North of Cyprus. Since Cyprus joined the EU in in 2003, borders were opened and it has been easier to travel between the North and South. Now, it enables to explore whole island. Local people from both sides enjoy daily shopping by crossing borders. It is also easy for tourists to cross the borders from both sides. We have given some tips those might help you travel to North Cyprus from the South. It is legally permitted to cross the borders in a North Cyprus car rental from the North to the South of the island but it is not advised to do this at this time. Car rental companies in North Cyprus will not allow their cars to be taken to the south because of the insurance cover complications. In most cases, South Cyprus insurance companies will not cover damages to the rental car. Private cars from both sides are also allowed with an extra insurance fee. From The South to the North of the island it is permitted to cross the borders in a rental car, but you are advised to discuss it with the South Cyprus car hire company as some of the firms do not allow their rental car to be taken to Northern Cyprus. If the car hire company is happy to rent the car to be taken into North Cyprus, then there is no problem, you can cross the borders from South to the North in a rented car. But you have to pay an extra insurance, so it is recommended that you can arrange your taxi transfer from the airport to your hotel in North Cyprus and rent a car there. It will usually cost you less doing it in this way. Offers very good deals on car hire with free deliver to a border crossing point in Nicosia, as well as taxi transfer from Larnaca to Kyrenia. A crossing point where you can cross with a vehicle, bicycle or by foot. This is a crossing point only for pedestrians, cyclists and diplomatic vehicles only. This border can be crossed with a vehicle, bicycle or by foot. This crossing point is located on the Larnaca-Famagusta road and for pedestrians, vehicles and cyclists. This is for pedestrians, vehicles and cyclists. When crossing from Southern to the Northern Cyprus it is advised not to carry any documents concerning your real estate; and do not buy any tobacco or cigarettes or liquor in excess of the quota stipulated. Do you get your passport stamped when crossing the border? When crossing over to the North Cyprus it is up to your discretion either to get your passport stamped or obtain your visa on a separate form provided at the crossing point. If you get your taxi transfer arranged with a taxi company in Northern Cyprus is will cost you less. Taxi fare from Larnaca Airport to Kyrenia is approximately £55 - £60 each way (See Larnaca Airport Transfer to/from North Cyprus). If you are using a taxi company in South Cyprus it will cost you around £90. 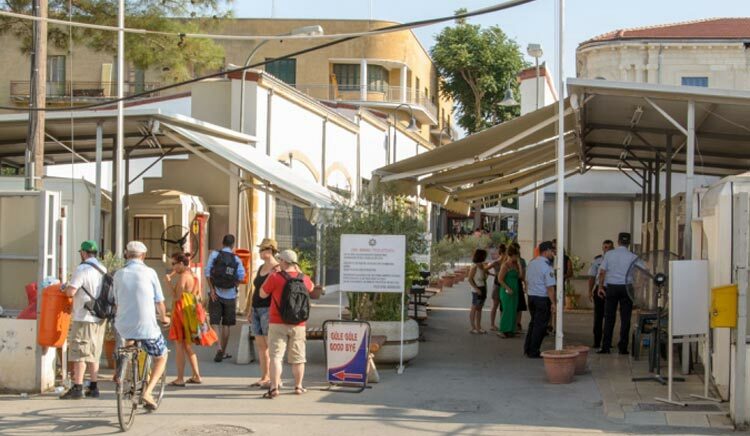 Read on Directions from Larnaca Airport to Kyrenia.